Born in Longton in 1895 and christened Vincent Bob, he was the first born of the twins; his brother was Kenneth Jack. In the middle of 1911, he joined his older brother Percy Norman as a boarder at Leys School, Cambridge. He remained at the school until 1913 when he returned home along with his brother Percy Norman. Later in 1913 he took and passed the pottery exams of the Stoke on Trent Education Committee after which he joined his father at the factory along with his brother Percy Norman. Also during 1913, he joined the Territorial Army. He became known by his middle name and was referred to as Mr Bob at the factory. A cup shape named after him, using his first name Vincent, was introduced around 1916 and was quite a popular shape. At the start of WW1 in 1914, he joined the 5th Battalion North Staffordshire Regiment and attained the rank of Captain. He was reported missing on the 21st March 1918 when he became a prisoner of war. He was repatriated on the 29th November 1918, after Germany signed an armistice agreement on the 11th November. On his demob from the army he returned to the factory. As he had a flair for organisation, he took over the running of the warehouses and stock control. Around 1920/1921, both brothers enjoyed motoring in their new MG Sports car. These journeys took them to Llandudno, where in the grand hotels they enjoyed dancing. It was on one of these occasions the brothers met two friends, Doris Hammersley and Eileen Nelson. 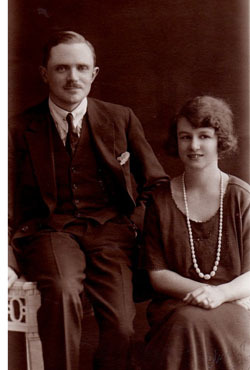 On the 17th October 1923 Vincent Bob married Doris Hammersley in a double wedding with his twin brother who married Eileen at Alsager, Cheshire. After returning home from honeymoon he lived next door to his brother in houses that had been built for them on Barlaston Road Trentham. On the 23rd January 1925 his first son Alan Donald was born. On the 10th June 1927 his second son Donald Percy was born and on the 9th March 1932 his daughter Margaret Jill was born. In 1929 Vincent Bob was given more formal responsibilities when the company ‘Shelley Potteries’ was formed. He became an equal shareholder along with his father and brothers. After the start of WWII in September 1939, the Local Defence Volunteers was formed on the 14th May 1940, after a radio broadcast by the then Secretary of State for War. (In July 1940 the LDV was officially renamed the Home Guard). 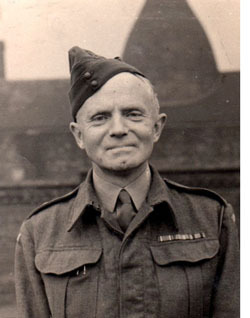 In late May 1940, Vincent Bob became the Commanding Officer of the 3rd Staffordshire (Longton) Battalion where he held the rank of Lieutenant Colonel. Besides continuing his work at the factory, he devoted much time and energy to the Home Guard duties. During 1944, Vincent Bob had the factory produce a tankard showing the serving officers, which is listed in the Specials Pattern Book, number 757. He also had one produced with the 3rd Staffordshire Battalion North Stafford Home Guard crest and underneath was the Fenton Nursing Institution above a crown with A. Coy. beneath the crown. This design is listed in the factories Specials Pattern book but does not have a pattern number. Also in 1944 he had an ashtray produced showing the Home Guard crest and on the underside, it stated ‘To Commemorate Your Service in the H.G. 1940 – 1944. It then carried his signature V.B. Shelley, Lt. Col Comd 3rd Staffs (Longton) Ba HG. The 3rd Battalion had 235 members and it seems that all the members of the Battalion were given an ashtray as well as the civilian female clerks who worked at the Home Guard offices based in the Clarence Pottery, King Street, Fenton. Following the successful landing in France and drive towards Germany by the Allies, the Home Guard was formally stood down on the 3rd December 1944 and finally disbanded on the 31st December 1945. Vincent Bob never saw the disbanding of his Home Guard Battalion that he had devoted so much time to, as he died of a heart attack on the 28th December 1945 aged 50.